The ARC of Jefferson, Clear Creek, and Gilpin counties honor IN! 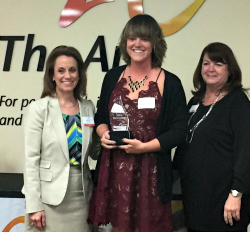 's project management intern, Sara, with the 2017 SPARC Education Award! Proudly, IN!’s Program Manager Intern, Sara Pielsticker, is the recipient of the 2017 SPARC Education Award for dedicating her gap year between college and law school as an intern at IN! providing valuable assistance toward the organization’s goal to open inclusive college options for students with ID. 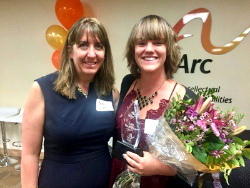 Annually, the Arc – Jefferson, Clear Creek and Gilpin counties honors people who demonstrate extraordinary leadership, changing the community and the lives of people with intellectual and developmental disabilities through the SPARC awards. A Colorado native, Sara graduated in May 2016 from the University of San Diego with a BA in Education and a minor in Nonprofit Social Enterprise and Philanthropy. This fall, Sara will continue her education at Syracuse University School of Law to pursue a unique joint degree: a JD with a focus on Disability Law and Policy and an MS in Inclusive Education. Sara chose to take a gap year before she entered law school at the University of Syracuse. Not ever willing to sit idle, she decided to spend her gap year following her passion: making our world a more inclusive place for our citizens with ID/D. Sara called IN! and asked if she could intern at our organization. She believes in the transformative power of education and the ability of our students to embark on the life-changing journey that a college education can bring. IN! did not have the budget to hire an intern, but that did not matter to her. Sara wanted to be part of making history for Colorado, by providing inclusive college options in Colorado for students with ID. She has a cousin with Down Syndrome, and she saw how disappointed he was when he watched his sisters go off to college, one by one, embarking on the next step of their lives, wondering why that same opportunity was not open to him. He did not understand why he didn’t get to go to college also. Sara started with us the very next week and has been an incredible asset to our organization ever since. IN! volunteers, Board Members and staff celebrate Sara's achievements. Sara brings a fresh perspective to the organization. She is a creative thinker, passionate about the cause, and possesses a “can do” attitude that spills out to everyone who comes in contact with her. She works up to 20 hours per week with IN!, yet does not bring home a single dime. She mans our tables at conferences and events, manages our social media efforts, is the editor of our newsletter “This Just IN!”, ran our end of the year holiday campaign, and travels to each college pilot site, talking with students and program leaders, documenting each initiative both verbally and through photographs. She was part of the Summertime Social Committee and is currently a member of the Marketing and Communications committee. Sarah is currently working with a videographer to create an awareness piece for IN! She has spent many hours developing a grant opportunity plan for our organization and contributed valuable insight at our Strategic Planning Retreat last fall. 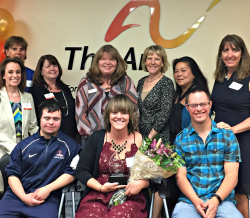 “Sara is destined to be a future leader and change-maker in the disability community in Colorado and in the nation. I don’t think that I have ever met such a mature, impassioned, and capable young person in my life. She pursues everything with a fire in her heart and mind. Sara believes that our world will be a better place if all citizens are valued for who they are and that every person, including those living with an ID/D, should have the opportunity to pursue their unique dream, contributing and adding value to their community,” states Beth Leon, Founder and President of IN! Sara has a passion for people with intellectual disabilities and is a known face in Colorado for her many years of dedicated service. She has been a camp counselor for Adam’s Camp; tutored multiple students with ID/D including those with cerebral palsy, Down syndrome, Autism and Williams syndrome; worked and traveled with the Wayfaring Band; supported events sponsored by the Rocky Mountain Down Syndrome Association; co-instructed the Emerging Leaders Course in college, teaching social justice and the social change model of leadership; and now is an intern at IN!. Congratulations to Sara and her achievements. It is reassuring to know that young people like Sara are our future.